Creamy banana ice cream that tastes like a pina colada! Made of frozen coconut milk, banana, and pineapple, its a light, healthy, delicious dessert! I want to get this out in the open right off the bat. This piña colada banana ice cream isn’t truly ice cream. Its more of “ice cream.” The catch? It doesn’t actually contain any dairy since the base is coconut milk instead – surprise! The coconut milk and banana makes it nice and creamy though so it’ll satisfy that same ice cream craving you have on these hot summer days. If you haven’t had banana ice cream yet, you’re in for a treat my friends. And adding coconut milk makes it oh so dreamy and delicious! And with the addition of pineapple, I’m in heaven, sheer piña colada heaven. And its naturally vegan, vegetarian, paleo, gluten free, dairy free, you name it. This healthy dessert fits pretty much all dietary restrictions. At first glance, the nutrition label may make you wonder what I’m talking about in calling this banana ice cream healthy since the primary fat type in coconut milk is saturated, which is normally given a nutrition thumbs down. The type of saturated fat in coconut milk is different than the type in animal products though! This article summarizes this in layman’s terms, but in an even shorter summary, your body processes it differently than it would with, say, pork fat, and its just better for you. 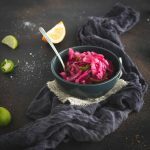 In this recipe I used full fat canned coconut milk, which has less added chemicals than aseptic cartons and is thicker and better for cooking than the fresh packed watered down drinking versions like So Delicious and Silk. 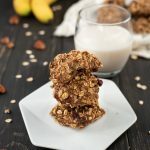 Even if it is full of healthy fat, the calories make this a treat and not an every day recipe (at least for those working your tooshie off for swimsuit season – PS, I don’t fit in this category this year). Banana ice cream works fine with low-fat coconut milk, it will just be less creamy and more icy-like. And the toasted coconut adds some extra coconutty goodness, so don’t skip it! Since we are already talking about nutrition and food labels, I read an article awhile back that I can’t find the link to for the life of me, about how much our diet can prevent age induced epidemics, like Alzheimer’s, that most of us readily accept are just an unpreventable side effect of getting older. I’ve actually read a few articles on this and have become a wee bit obsessed with this concept. Food is medicine people! But for this to work, you need to act preemptively and not wait until you get sick. Many researchers predict that today’s school-age children are the first generation in modern times projected to have shorter life expectancies than their parents. Now that I have a little one of my own and my own eating habits are under close baby eyed scrutiny, its putting a whole new perspective on all of this for me. As most parents do, I want the world for my baby, but giving her this means setting the example myself. Luckily, recipes like banana ice cream make that easier, but it still takes being conscious of what and how I eat in a whole new way. In my past day job as an energy efficiency consultant, I toured factories and consulted on how they could become more energy efficient (in a nutshell). This was a truly eye-opening experience into how products get from raw materials to our doors, and in the case of foods, into our bellies. I know after getting this inside sneak peek into how food is made, I am more motivated than ever before to avoid overly processed foods and pay more attention to where food comes from. Not all by any means, but the way some food is made is just plain gross (ahem – hamburger I’m talking to you). I’m by no means a dietician or expert on the topic, but health and nutrition is something I spend quite a bit of time reading about and am always aiming improve on. The more I learn, the more driven I am to eat simple and pack as much plant-based food into me and my family as possible. Don’t get me wrong here, I’ll probably never give up REAL ice cream or bacon and won’t become a full-on vegetarian at any point in my life. And you may disown me for this… but in my opinion, this is okay. Making small changes can have a huge impact too! When you eat brie, chocolate, gelato, steak, and all of the delicious treats that make life awesome, just try to avoid mindlessly stuffing your face and focus on savoring and enjoying more reasonable portions. I eat some kind of treat every. single. day. and this is what makes life fabulous in my opinion, but you’ve got to eat your veggies too, and they can be fabulous too (this ratatouille and these brussels sprouts are some of my fav fab veggies). This is what I want to model for my daughter: not being afraid to live life and enjoy all it has to offer, but remembering to eat food that nourishes as well. The two don’t have to be exclusive and can and should go hand in hand. Our diets are a journey not a destination. We are what we eat and this journey should be focused on progress and growth, not perfection. Okay, *officially jumping off my soap box* and getting back to pina colada banana ice cream and a few deets on that. Umm… would you check out the ingredients that go into this tasty, healthy dessert? Take a look at the pic below and tell me that doesn’t look like a delicious combo. I dare you. The main thing about this recipe that I want to emphasize is that the freezer time is critical. You cannot, I repeat, CANNOT, over freeze the coconut milk ice cubes. If they become fully solid all the way through, your blender or food processor will protest and may just give out on you before you get the creamy, delectable banana ice cream of your dreams. Truuuust me. I almost broke my blender during recipe testing this however many years ago. Sure, you can just let them defrost a bit before blending, but they’ll still be rock hard at their core which will be hell on your blender. Just don’t leave them for more than an hour and a half, two hours tops in the freezer and you should be good to go. Yes, its a multi-staged freezing process to get it to the best consistency, but when you’re spooning this into your mouth and swooning with banana ice cream love, you’ll get why its worth it. And since coconut milk freezes into such an insanely icy solid state, you’ll need to let this site for 15 minutes before it will be scoop-able. Not a problem, just plan ahead a bit. I’ll emphasize again, its worth the wait. And if you decide to serve this banana ice cream with piña coladas for a full on pineapple coconut obsessed frenzy, I won’t judge. In fact, I’ll solute you and may just invite myself over. Creamy banana ice cream that tastes like a pina colada! The base is made of frozen coconut milk, banana, and pineapple for a light and healthy dessert. Slice bananas into 1/4 - 1/2 inch pieces and cut pineapple into similar sized pieces. Pour coconut milk into an ice cube tray. Put pineapple, banana pieces, and coconut milk into freezer and freeze for 1 1/2 to 2 hours until mostly solid, but not rock-hard. DO NOT freeze for longer than this or your blender or food processor will not be able to blend it! Remove from freezer and add frozen pieces to food processor or high-power blender. Blend until creamy. Add toasted coconut* and pulse once to mix into ice cream. Either serve immediately as a soft serve type ice cream or re-freeze in a bread pan for a more solid version. If re-freezing, remove from freezer 15 - 20 minutes before serving and allow to sit on countertop to make scooping easier.